Last month we launched Apps of the Month: a series dedicated to profiling iPhone apps that you should actually buy, instead of the ones that simply got the most hype. This is a tough task, given the 100,000+ apps on the store and the fact that discovery is an absurdly difficult task, even for those who spend as much time as we do playing with iPhone apps. Of course, we scoured our inboxes and the App Store in search of fun, interesting and useful applications. Some will tickle your fancy and others won’t be your cup of tea, but regardless, it’s better to have some recommendations than none. Enjoy. This is my iPhone Game of the Month. Perhaps the biggest launch of the month was Eliminate Pro by ngmoco, a major iPhone game publisher funded by Kleiner Perkins Caufield Byers’ iFund. Within just 2 days, Eliminate Pro was downloaded 500,000 times, which is absolutely absurd. The game is ground-breaking in many ways: it is one of the biggest free apps ever released on the iPhone. A major publisher, ngmoco, has bet on in-app purchases for free games, just months after Apple announced the feature. Finally, the game is addictive and an impressive feat of technology for the iPhone. It is a online multiplayer first-person shooter. The controls are intuitive and fairly precise. Overall, it’s a fantastic value on the iPhone and proves yet again how powerful this device can be. The downside is simple: though the app is free, you can only play for a limited amount of time. You start off with enough energy to play roughly 4 games for the first hour, and then it takes another 3 hours before you can play the game again. Personally, this didn’t bother me since I usually play iPhone games for short bursts. However, there was a torrent of criticism regarding this on the App Store – in fact, 15,000 out of 50,000 ratings are for 1 star. And the reason is clear: there are hundreds of reviews on the store like this: “They really nickle and dime you for this.” Obviously, many App Store customers are not quite ready for the pay-to-play model. I’ve said this before, but the iPhone is the perfect device for racing games, especially with accelerometer controls and powerful graphics. 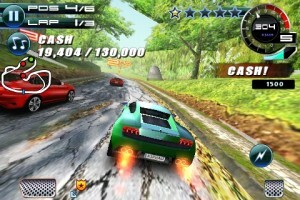 Gameloft’s Asphalt 5 takes full advantage, and brings a powerful arcade-style racer to the iPhone. With slick 3D graphics and awesome gameplay, this racing game will undoubtedly leave you satisfied with your purchase. The game features a vast array of cars, from the Lamborghinis to Corvettes to Ducati motorcycles. There are also a variety of game modes, including time trial, cop chase (where you try to force as many opponents as possible to crash), and traditional races. Add the fact that you can race in Las Vegas, San Francisco, Hawaii and Rio de Janeiro, and you’ve got a hand-held bucket of racing goodness. Judgment Day War by G5 Entertainment is like a real-time version of Risk, the classic board game where you try to dominate the world. In Judgment Day, you control an army of either tanks, helicopters or both, and your goal is to destroy the enemy’s troops. It is extremely simple when you play it: you get a certain number of troops on each of your territories, and your opponent has the same. Furthermore, there are blank territories with unaligned troops that you can conquer. 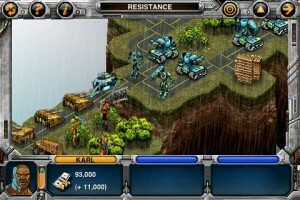 More territories means your troops replenish faster and certain territories have stronger defenses to fend off enemies. I picked this game up and didn’t stop playing it until I was done. Took me a short 2 days, which is definitely the only downside to the game. But when the worst part of a $1 game is that you wish they made more levels, you know it’s more worthy of your Washington than a McDouble. Another virtual goods-powered game from ngmoco, Touch Pets Dogs is like a modern Tamagotchi. 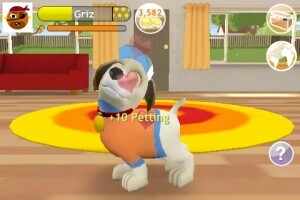 It is a handheld virtual pet; you choose from one of many varieties of dogs and you name, dress, feed and bathe the pet. Honestly, I’m not much of a virtual pet person – I had a Tamagatchi when I was younger but that was more to be like the other kids in school than it was out of personal interest. That said, this app is extremely well done and I definitely think it’s perfect for girls (a commenter on last month’s Apps of the Month requested more apps for women). You can do pretty much anything to your pet, including playing ball (or fetch), giving it a bath, feeding it, dressing it, etc. The only time you pay is if you want your pet to live, in which case you’ll have to buy food to feed it. 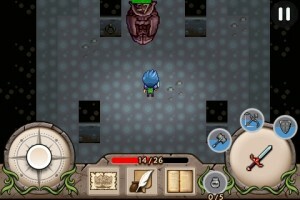 Fantasy Warrior: Good & Evil is kind of an iPhone version of Zelda. It’s an RPG but with graphics that still look like they’re from the Gameboy days. Naturally, I was skeptical of the game – and honestly it was hit or miss from me in the beginning. That said, it is extremely deep and for $1 it is a great buy for RPG fans or people who are just bored and want a cheap, long game to dig their heels into. Made by Digital Chocolate, Fantasy Warrior doesn’t have the flair of a Gameloft or ngmoco game. The fight scenes are a joke – you move in 2D and slash your sword at the enemy with awkward battle mechanics. However, the RPG nature really keeps you hooked: the game is challenging enough that it keeps you involved and easy enough that you don’t find yourself trying to beat a boss more than three times before succeeding. This app simply isn’t for everyone, but for those of us who need to sign or edit documents regularly, it’s a clear winner. 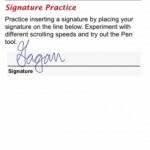 Zosh is an app that lets you take PDF’s (only format supported for now) and sign them or write on them via your iPhone. If you get a form for work or from a doctor/lawyer that you need to sign, you forward the e-mail to mydocs@zosh.com and then bring up the app on your iPhone. Zosh automatically downloads the document for you, and you can tap anywhere on the document to sign or write on it. If you want to sign, it uses the iPhone in landscape mode and lets you sign as the screen moves. You have to try it to really understand, but essentially you sign your name on your iPhone while the “paper” you’re writing on moves so you can fit your entire signature on the small iPhone screen. Anyways, it’s extremely well done and this app provides solid utility for anyone who’s on the go often or simply doesn’t want to physically print and sign documents. I got two real-time strategy games in my inbox this month: Command and Conquer Red Alert [iTunes Link] by EA and The Settlers [iTunes Link] by Gameloft. Both were impressive and I enjoyed my time with them, but neither made the list. 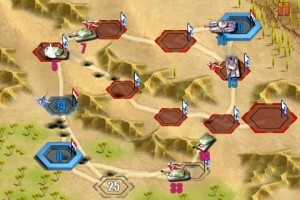 Perhaps it was because I think the control scheme for a Real-Time Strategy game on the iPhone has yet to be mastered. Or maybe it’s just because Rogue Planet, a Turn-Based Strategy, developed by Agharta Studios, was far more compelling. 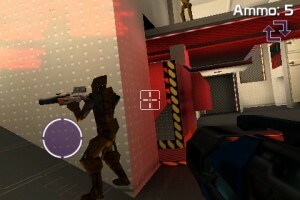 Published by Gameloft, Rogue Planet is a sweet mix of hot graphics and addictive gameplay. It is a solid buy for fans of Advance Wars for Gameboy or Reign of Swords [iTunes Link]. The only complaint I have is that though the storyline was interesting, it was shoved down your throat a bit too much: I hate tapping through cut scenes without any way of skipping them entirely. That’s our list for this month. Tune in next month for the best of December 2009, and don’t forget to e-mail us with submissions. Oh, and feel free to rave (or rant) about my choices in the comments. And if I missed an app, feel free to sound off.